The starting date for this special month was chosen because September 15th marks the anniversary of independence for five Hispanic countries—Costa Rica, El Salvador, Guatemala, Honduras, and Nicaragua. In addition, Mexico achieved independence on September 16th, and Chile on September 18th. To identify cultural practices of a culture through the study of the folktales, music, and art created by people living in that culture. Describe family and local community customs and traditions. Describe life in other countries with emphasis on daily life. Crepe paper in a variety of colors cut into lengths for streamers about 12"
Plain White index cards 4"x6"
Procedure: Do one lesson each week between September 15th and October 15th. Say: “This week begins Hispanic Heritage Month. During National Hispanic Heritage Month many celebrate the histories, cultures and contributions of American citizens whose ancestors came from Spain, Mexico, the Caribbean and Central and South America." Use a map or globe to point to all of the countries. Say: “In this book we will learn about some of the things that are different between the cousins and things that are the same. Be ready to list two things that are the same and two that are different." 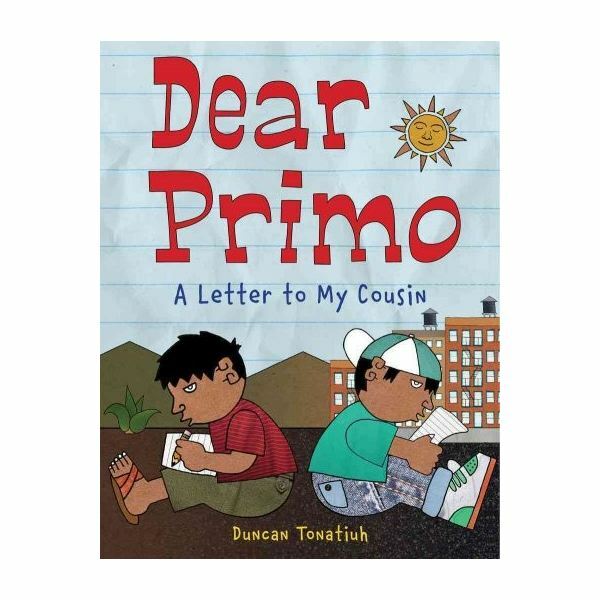 Read Dear Primo: A Letter to My Cousins by Duncan Tonatiuh. Fold a paper in half lengthwise. On one side write two things that the boys in the book had in common. On the other side write two things that were different. Assign each student a Hispanic country. You may write the countries’ names on slips of paper and have the students choose a country. Then use this website https://www.factmonster.com/spot/hhmflags1.html (either print the page and cut apart or project it on a screen) Students should use a ruler (if necessary) and art supplies to create the flag of the country chosen. Say, “In many of the Hispanic countries the climate is different from ours. Because of this there are different animals, different foods, plants and different lifestyles." Read the book A-Z Mexico by Justine Fontes. This book shows the animals, clothing, festivals, schools and more that are found specifically in Mexico. But many of these characteristics can be found in other Hispanic countries. Choose 2 or 3 of the categories in the book, for example, animals. The students should write about their favorite animal from the book and draw a picture. Hispanic Americans have positively influenced and enriched our nation and society. There are artists, musicians, singers, astronauts, worker’s rights activists and even a Supreme Court Justice, all of whom have made a difference in our country. Use this book The Storyteller’s Candle by Lucia Gonzalez. It is the story of New York’s first Latina librarian. She was a storyteller, too. The book is written in English on one page and Spanish on the facing page. Provide an assortment of books about Hispanic Americans for the children to view in their spare time. Below are some great choices. Es tiempo de fiesta! It’s time for a party. Enlist the help of your students’ parents to provide refreshments and assist with the fiesta! Choose some lively music from the local library to add to the mood. Decorate the backside of a white paper plate. Use markers, paint or crayons. Encourage students to cover it completely with bright colors. Fold the plate in half and staple the edges together leaving a small space to fill the “pocket" with beans. Then close up the hole. Staple four strips of crepe paper to the edge. Make some noise in time with the music! Tonatiuh, Duncan. Diego Rivera: His World and Ours. Abrams Books for Young Readers, 2011. Laezman, Rick. 100 Hispanic Americans Who Shaped American History. Bluewood Books, 2001. Guzman, Rick. Cesar Chavez: Fighting for Fairness. Enslow Elementary, 2006. Guzman, Lila. Ellen Ochoa:First Latina Astronaut. Enslow Elementary, 2006. Dunham, Montrew. Roberto Clemente:Young Ball Player. Aladdin, 1997. Ada, Alma Flor. I Love Saturdays y Domingo. First Aladdin Paperback, 2002. Novesky, Amy. Me, Frida. Abrams Book for Young Readers, 2010. Tonatiuh, Duncan. Dear Primo: A Letter to My Cousin. Abrams Books for Young Readers, 2010. Garza, Carmen. Family Pictures/Cuadros de Familia. Children’s Book Press, 1997. Fontes, Justine and Ron. A-Z Mexico. Scholastic, 2003. Gonzalez, Lucia. The Storyteller’s Candle. Children’s Book Press, 2008.